Against a harrowing backdrop of international news, and concerns here in the UK, people from different backgrounds and traditions are gathering on Monday 15th September for a peace conference. Here is an opportunity to engage with a wide range of experts and practitioners, contribute your own insights and experience, refresh your conflict transformation skills, understand the hopes and fears of communities here and overseas and take an active part in workshops and panel discussions. The Muslim-Jewish arts group MUJU will be with us, showing us their latest work. 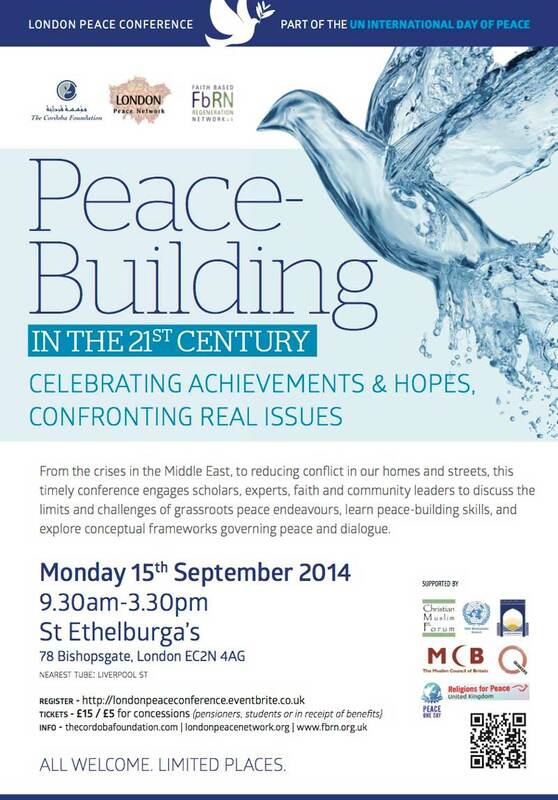 Panels include: Peace v War, Grassroots Peace-building, Conflicts in the Middle East, Peace or Appeasement? Register now – your contribution of £15/£5 will help cover costs & includes lunch at St Ethelburga’s Centre for Reconciliation and Peace, 78 Bishopsgate, London EC2N 4AG. St Ethelburga’s is a beautiful & poignant venue but there is limited space, so register soon if you plan to attend. Download the flyer and pass on the invitation to your friends, colleagues and networks. More information from The Cordoba Foundation 020 8991 3372, the London Peace Network 07903 682 142 or the Faith-based Regeneration Network 020 7840 0138.